The Romney campaign promptly pointed out that 2.0 growth amounts to “less than half the 4.3% rate the White House projected after passing the stimulus bill.” Nor was this the Obama administration’s only overly optimistic prediction. As Pethokoukos reminds us, in its 2010 forecast, the White House said it was looking for 3.5% GDP growth in 2012; in its 2011 forecast, it predicted 3.1% growth in 2011; and in its most recent forecast, the White House predicted 3.0% growth this year. – Research from the Fed finds that since 1947 when two-quarter annualized real GDP growth falls below 2%, recession follows within a year 48% of the time. Right now we are at 1.65%, putting the economy firmly within the recession red zone. 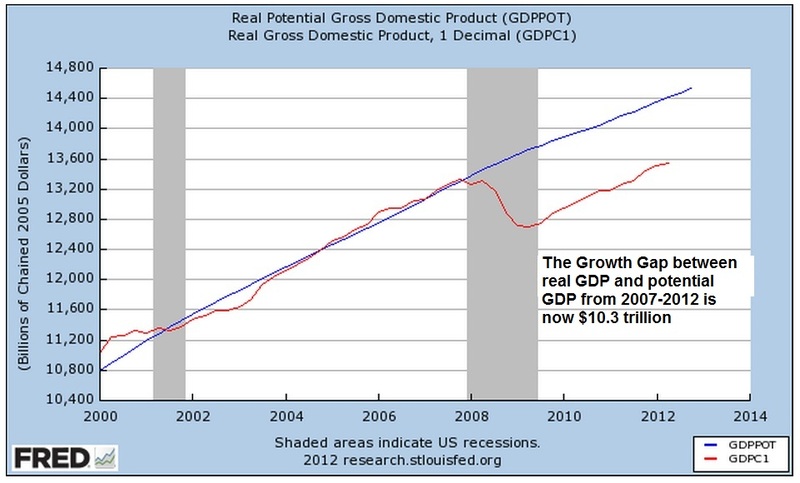 – When year-over-year real GDP growth falls below 2%, the Fed found, recession follows within a year 70% of the time. At 2.3%, we are dangerously close to stall speed. – A Citigroup analysis has found that when U.S. growth falls below 1½% on a rolling four-quarter basis, it has tended to fall by nearly 3 percentage points over the following four quarters. What will the fourth quarter bring? As the impact of our approach to the fiscal cliff increases, we’ll probably be lucky to match the third quarter’s 2.0 growth figure.